New Jersey has plenty of tall buildings, to be sure, but it's not known for its skyscrapers. A new development planned for Jersey City hopes to change all that with a bright blue set of towers that will boost the city's skyline. Located in the Journal Square neighborhood of Jersey City, the 1,840 unit-development will be called Journal Squared (although, shouldn't it really be Journal Cubed?) and hopes to attract young professionals who can easily get to work in Manhattan using the adjacent PATH station. In addition to the residential units, the development's base will have retail and and restaurants, and a large public plaza will be programmed with a farmers' market and movie nights. 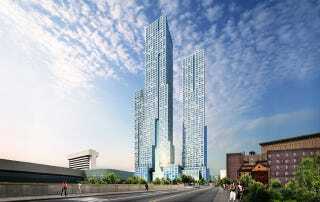 The complex is designed by HWKN and Handel Architects and will feature three towers, one of which will top out at about 729 feet, making it the tallest residential building in New Jersey (the press release says it will be the tallest, but Cesar Pelli's 30 Hudson Street in Jersey City will remain the tallest at 780 feet). Bruce Mau Design did the identity and wayfinding. According to the designers, the buildings will serve as both a gateway to the state and as a new urban center for the city. "We designed a building that works equally well at the scale of the Turnpike, where hundreds of ￼thousands of people will see it every day, and at the scale of the human who walks and lives in ￼the city," says HWKN partner Marc Kushner. It should be complete by 2016. Of course you can see plenty of New Jersey's buildings from Manhattan, but this one seems like it was both designed to stand out and combat the gritty, industrial vibe that dominates the lands just across the Hudson. The use of blue—and that sure it a lot of blue!—seems to communicate a freshness while hoping to remind New York City that, hey, New Jersey is RIGHT OVER HERE.